I stuck this note to my desk at work in early 2016. I had just started a new position and was feeling out of place, lost in life, and quickly running out of steam. To try to get better aquatinted with my new job (a curriculum developer for a state agency), I began taking online classes on project management, planning, design, running teams–anything and everything that might be able to help me figure out what the heck I was doing! It was one of these online classes (so help me, I can’t remember which) that would be the stone cast into the proverbial pond that sends out ripples upon ripples. In this class, the facilitator directed learners to consider this: if you could be given a comfortable income and not have to worry about working for your money, what would you be filling your time with? Or, if you had unlimited amounts of extra time, what would you be doing more? The facilitator then told us to pause the video and write down what immediately popped into our heads. Doing as I was told, I grabbed a stack of nearby post-it notes and this is what I wrote down. 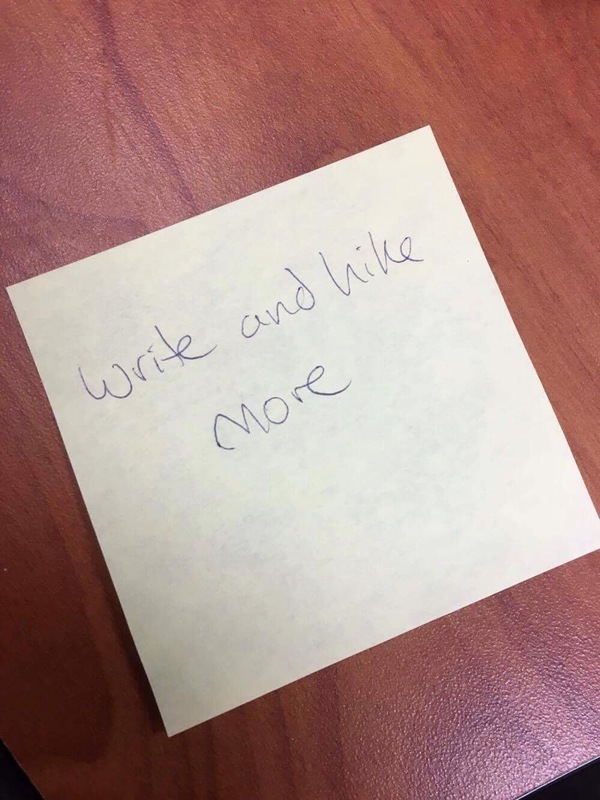 “Write and hike more.” The course continued along, and at the very end the facilitator said to leave what we had written down somewhere visible as a reminder. I almost threw my little note away, but it seemed like a nice idea so instead I shrugged and attached the post-it to the desktop near my computer monitor and thought nothing of it. Shortly thereafter, a strange thing started to happen. I found myself glancing at the post-it note from time to time and my mind turned more and more to hiking. At first it was subtle… Cubical decorating subtle. I went out and bought a poster of the Olympic Mountain Range. I printed off a few pictures from a hike the year prior and posted them on the cubical walls as well. Then I emailed myself beloved outdoor images from over the years and those became backgrounds on my computer desktop. Now, surrounded by images of gorgeous places, my mind focused even more on hiking (now how could that have happened, I wonder?) and I began messaging with the guys I had hiked with a year prior to see what they had been up to. In a short time, I was making plans for an excursion with a friend… And since then, hiking has rocketed to a top priority in my life, no longer relegated to a pleasant after-thought in the catalog of replies to the query, “what do you do for fun?” Now, hiking is billed unapologetically as a passion, a defining part of my life! Ah, but look at that note again… Hiking is only half of the message. I closed out 2016 with a massive pile of new gear, check marks to my hiking to-do list, and a growing reputation as a girl who is always out hiking somewhere new… Without having upped my writing quota in the slightest. That unfinished half of the post-it seemed to glare up at me after every weekend, demanding an explanation for the forgotten other half. I knew I would need to do something. And so, without further ado, it begins. Carpe diem!